Saturday March 15th 1879. I helped all the forenoon with the work it was very late when we got up Did some mending in the afternoon and went to town with Lee in the phaeton Mrs Fletcher and Frank spent the evening here. Weather still cold. Sunday March 16th 1879. I went over to church this morning. I read all the afternoon I do not feel very well but went to church again at night Emory Miller preached at both services today, and the sermons were rare ones. 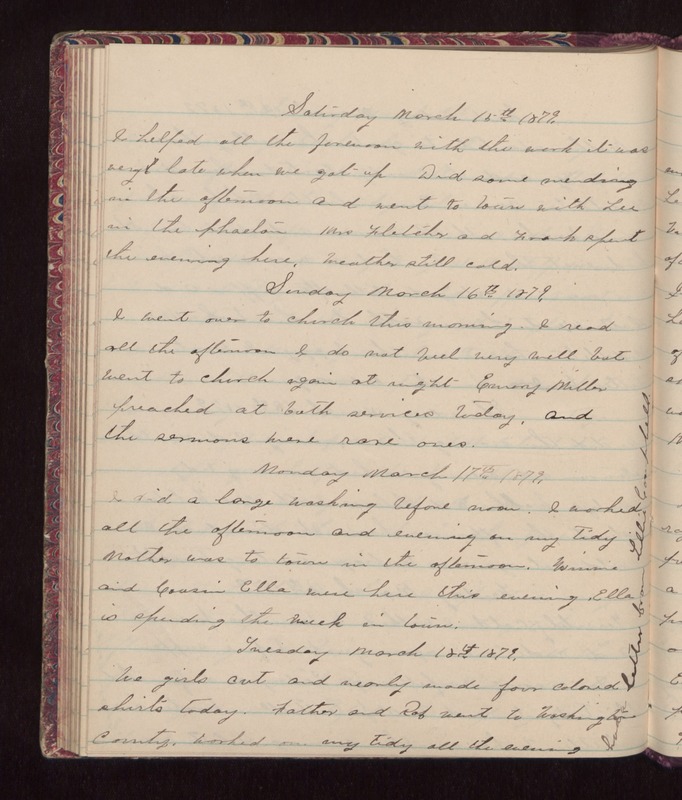 Monday March 17th 1879. I did a large washing before noon. I worked all the afternoon and evening on my tidy Mother was to town in the afternoon. Winnie and Cousin Ella were here this evening. Ella is spending the week in town. Tuesday March 18th 1879. We girls cut and nearly made four colored shirts today. Father and Rob went to Washington County. Worked on my tidy all the evening had a letter from Lillie Campbell.